Age spots, also called liver spots, are flat brown, grey and black spots that vary in size. They usually appear on the hands, shoulders, face and arms, i.e. areas that are most exposed to the sun. They have nothing to do with the liver or the liver function. Age spots are very common in adults older than 40 years of age, but they can affect younger people as well. One's genetic make-up may also play a role in how susceptible one is to the development of age spots. Age spots appear when the melanin (pigment in the upper layer of skin that gives the skin its normal colour) becomes clumped, or is produced in very high concentrations. In addition, aging can also cause extra production of melanin. 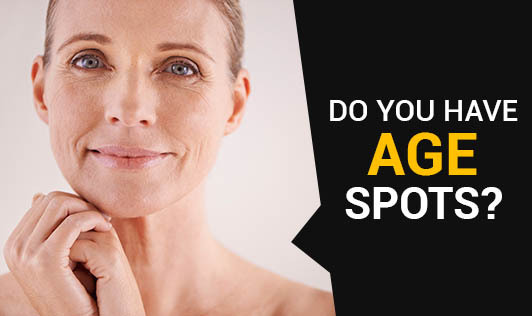 Age spots are usually harmless and treatment is not needed in most cases. However, many people may not like the way they look. Sometimes, the spots that are dark or have changed in appearance may be a sign of a serious skin problem. Hence, it's best to have any new skin changes evaluated by a doctor, especially if you have a spot or a lesion that is rapidly increasing in size, darkly pigmented, has an unusual combination of colours and is accompanied by redness, itching, bleeding or tenderness. Anyone can develop age spots, but one can prevent age spots by avoiding the sun and using sunscreen. This may be the easiest way to maintain one's skin's youthful appearance and to avoid those dark skin spots!